I found your article on using neem as a fungicide and insecticide very very useful. I have a fairly large garden infested with mealy bugs and leaf cutting insects. At first I used a commercial neem preparation called Vijayneem available in shops but did not know that it could be used once in three or four days when the infestation is severe. Where I live I can get pure neem oil. How do I make it miscible in water so I can spray it? I added a little bit of hand washing liquid. But my sprayer was coated with semi solidified neem oil. How many ml of neem oil should I add to one liter of water? If adding soap, how much should I add? How often can I safely spray a highly infested plant? All in all after reading your article I know I can have all the butterflies and birds back in my garden thank you. Nirmala, it is wonderful to see that you are going the organic route, and care about the butterflies and birds in your garden! With regards to using 100% cold pressed neem oil for spraying can be tricky, as you have found out. It is viscous and will stick to your equipment if you don't use it correctly. I use a tank sprayer with a pump action, which I prefer to a hand sprayer. However, that doesn't mean to say that you cannot use a hand sprayer, whichever you use, you just have to be very careful in the mixing process. You will notice with neem oil that if it has been stored for a while it actually solidifies. 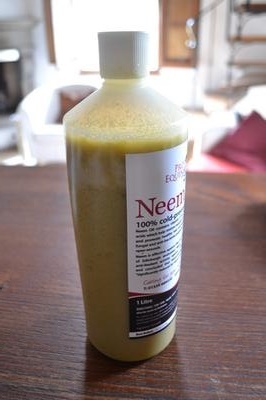 In order to get your neem back to a liquid state, place the bottle up to the neck in fairly warm water. This is the first step. I have submitted a picture of my cold pressed neem oil that has been standing a while and has solidified, so readers can see what I mean. It has gone a creamy color. Liquid neem is brown. You don't want to place the bottle in hot water, but just very warm water. It won't take long before your oil is now liquid. If you want to use a 1 quart spray bottle which is just less than 1 liter, you want to first add 1-2 teaspoons of washing up liquid to 1-2 teaspoons of neem oil. If you are going to make a gallon of water, then use 1-2 tablespoons of oil and 1-2 Tablespoons of soap. First add the water. Then add the oil and finally add the soap. Now give it a shake. If you are using washing up soap, you will find that you probably won't need to add the second spoon. If you find that your neem oil is still floating to the top, add a little more soap so that the oil is broken down further. Once there is no more floating oil, you are ready to spray your plants. Use neem oil once a week on heavily infested plants, or any other plant. I do this as a weekly routine in my vegetable garden. You can also use neem oil to help prevent powdery mildew. Add 1 teaspoon bicarbonate of soda or baking soda to your quart bottle, or 1 tablespoon of bicarbonate of soda, or baking soda to a gallon of water. 1 US gallon is just under 4 liters of water.